He joins 13 other researchers from around the world who will receive $10,000 each for top-rated curricula designed to develop business and technical skills required for data-crunching jobs. The winning proposals include programs and research focused on computer science/electrical engineering, business administration, economics, strategic management and math and statistics. Chawla’s award is to develop a novel data science program that requires immersion of an individual in a domain to innovate by conducting data exploration, feature engineering and machine learning, and to inform system design and database design and conduct what-if analyses. 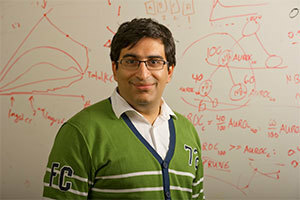 Chawla’s area of research is data mining and machine learning. He also is at the frontier of interdisciplinary applications with innovative work in health care analytics, climate and environmental science and network science. His research in data-driven personalized health care is focused on patient-centered disease diagnoses and management. Chawla is the recipient of the IBM Watson Solutions Faculty Award, which recognized individuals who are on the cusp of the next big trend in computing — big data and analytics — and are introducing that information to their students via innovative curricula. He is the recipient of multiple faculty awards for research and teaching innovation, including a National Academy of Engineering New Faculty Fellowship and a number of best paper awards and nominations. He currently serves as the chair of the IEEE CIS Data Mining Technical Committee and also serves on a number of editorial boards and organizing/program committees for conferences. He is a fellow of Notre Dame’s Reilly Center for Science, Technology and Values and the founder of Aunalytics Inc., a startup focused on big data and analytics. Originally published by William G. Gilroy at news.nd.edu on August 14, 2013.